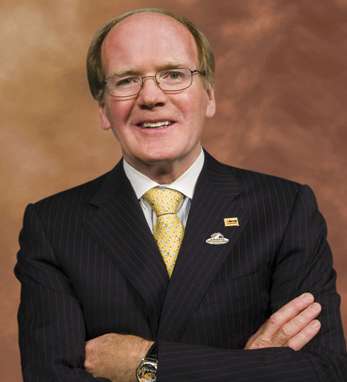 Dr. T. Pearse Lyons is the founder and president of Alltech, a global animal health company founded in 1980. Since then, the company has grown to annual sales of nearly one billion dollars. In 2013, Alltech supported The Gathering Ireland, participating in the Kennedy family’s anniversary trip to the Isle. Distillers before founding Alltech. Since then, he has authored more than 20 books and numerous research papers in scientific journals. Alltech’s commitment to equestrian sport began with the Alltech FEI World Equestrian Games 2010 in Lexington, Kentucky, attended by more than half a million spectators and seen by 500 million television viewers. Pearse’s leadership led to his receiving the Commonwealth of Kentucky’s first-ever Legacy Award in 2011. In 2013, he received the Royal Dublin Society Gold Medal for Industry and Commerce.